Mrs. Doina Ciomag graduated economics, with a major in trade, and she graduated the Executive Master in Business Administration at Washington University - Seattle, USA in 1996. Her expertise and professional career are related to advocacy and management consultancy services. Doina started working with Foreign Investors Council (FIC) even before the Council was legally registered in 1997. She accepted the challenge of organizing and managing the newly established foreign investors association named Foreign Investors Council. After 18 years of passionate work, by Doina's leadership, the FIC is widely recognized as one of the most respected and influential advocacy associations in Romania, whose observations are accurate and whose recommendations are reasoned and sound. The primary objective of the FIC is to assist in developing the most effective business environment, within a framework of strong social responsibility and sustainable development. Doina's main endeavour is to generate constructive and effective communication between foreign investors and the authorities. She manages the dialogue with the competent authorities, on various topics of concern for FIC member companies. As a result, the Government of Romania seeks the FIC's comments on draft legislation and regulations. The FIC's recommendations, which aim to represent not only the best interests of foreign investors but also of the entire business community, are increasingly incorporated into new legislation and policy. Every two years, the FIC publishes, under Doina's coordination and supervision, the White Book, which provides a comprehensive overview of Romania's investment climate and specific recommendations for improving the business environment. The White Book is the result of the valuable and voluntary contribution of time, resources, and efforts by the FIC's members. 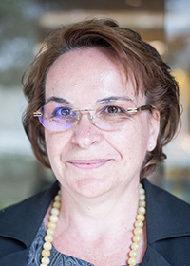 Doina's expertise in the management consultancy is related to the position of Senior Consultant she had in 1991-1996 with the German firm Roland Berger & Partner, and the two short assignments she had with Larive as person in charge with the Investment Fund Eurobalance and with Deloitte & Touche as responsible for the companies valuation projects.